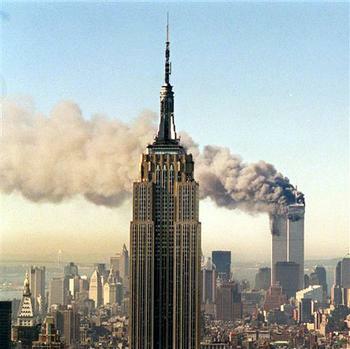 It was 10 years ago today that the twin towers came tumbling down in lower Manhattan. Attacked, brutalized, terrified, America and the world was turned upside down by a small band of Al Qaeda terrorists. That morning is still crystal clear in my mind, the refusal to believe what I was being told coming into work, that the World Trade Center towers were on fire. I'm not sure if we knew clearly and completely that they had been hit by planes at that point. But as word spread that not only had two planes careened into each of the towers, a third had made a direct hit on the Pentagon, and a fourth seemed to be making a dash for the White House. We were under attack. In those moments, we didn't have the luxury of knowing that the worst was behind us. I remember feeling that I needed to grab my family and hold them close, that in an instant life as we knew it was no longer assured. Experiencing the Fire Fighter Memorial Ceremony today, I pondered what our local responders were thinking and feeling as they watched their IAFF (International Association of Fire Fighters) brothers and sisters from afar on their television sets, pouring into the lobbies of those iconic structures. They put themselves in harms way by the hundreds, running up the concrete stairwells as petrified citizens were running down, scrambling for their lives. 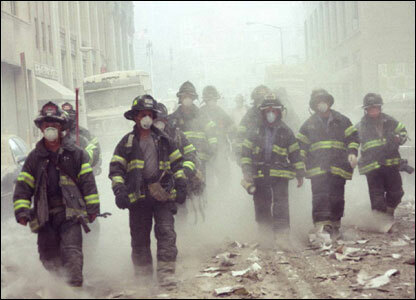 I think of the fire fighters, police and paramedics who were lost that day, every time I find myself in a concrete stairwell. I'm sure this is a common response. What was going through their minds as they raced up, loaded with gear, becoming more and more exhausted with each step? Did they sense that that moment or the next might be their last? Were images of their loved ones going through their minds like a slideshow of memories? Perhaps they were silently praying, and having an inner dialogue to calm their nerves. Perhaps they were so much in the moment that fear fell off of them, as if carried away on a breeze. As the Last Post gave way to Reveille we remembered, in silence, in gratitude.